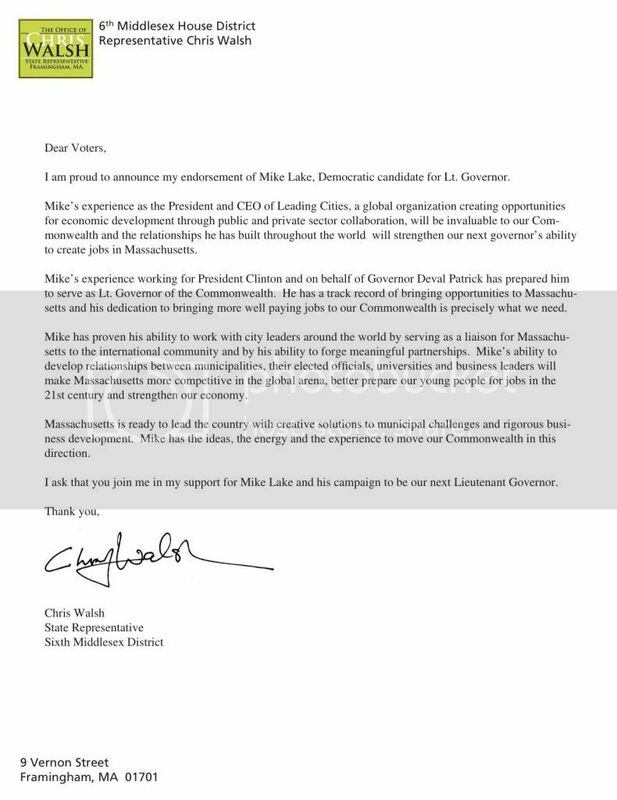 (March 10, 2014- Boston, MA): State Representative Chris Walsh officially endorsed Mike Lake, Democratic Candidate for Lt. Governor. Walsh praised Lake's involvement in outreach to the international community on behalf of Massachusetts. "Mike has proven his ability to work with city leaders around the world by serving as a liaison for Massachusetts to the international community and by his ability to forge meaningful partnerships," Walsh said. "Mike's ability to develop relationships between municipalities, their elected officials, universities and business leaders will make Massachusetts more competitive in the global arena, better prepare our young people for jobs in the 21st century and strengthen our economy." Walsh—who represents the Sixth Middlesex District—expressed his admiration of Lake's dedication to bringing business and opportunities to Massachusetts.